The first Royal awarded school from His Majesty the King; Thai Massage school in Thailand. TMC received the award of excellent education in all 12 categories from the Thai Ministry of Education Department for the award year of 2013. This is the assurance that the quality of education at TMC meets all requirements. We at TMC always monitor and improve our quality ongoing basis. We believe and totally commit to provide the highest quality education to true seekers of Thai massage knowledge from around the world. We perform what we mention in our website. Thai Massage School of Chiang Mai, founded in 2001, inaugurated by Mr.Udom Puasakul, Deputy Governor of Chiang Mai Province at that time, (2012: Director General, Department of Public Works and Town & Country Planning), highest honored by Dr. Chao Duangduan na Chiang Mai, Lanna Pricess (the president of Chiang Mai Culture Office who is the most prominent and respected figure of northern Thailand) presided over the opening of the school. Thai Massage School Thailand was later founded in 2002 with extensive courses. Both schools are operated with strong determination by Jan Chaithavuthi and Kanchanoo Muangsiri to aim for high standard of Thai massage teaching. The purpose is to preserve the ancient art of teaching and promote integrity of Thai massage. 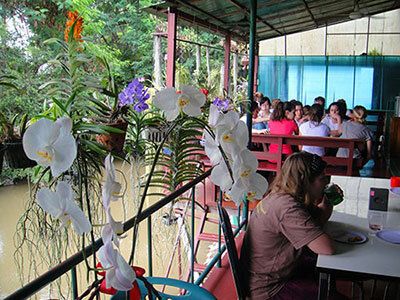 Two schools are located near each other on the bank of Mae Khao Canal, a short distance outskirt of the busy city life. Knowledge is sacred-the seeker is a noble one. Thus, the giver must be totally sincere and honest. We strive to give the highest quality education. TMC school is blessed with noble people from the inception and continue to the present day. We believe in doing good deed for people. 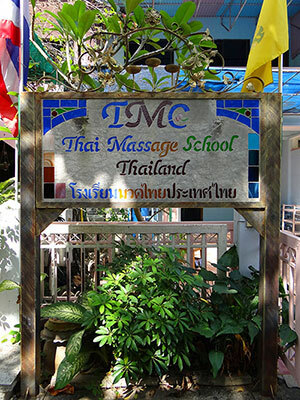 Since 2001, the school has been honored by people with the same belief to preserve and support TMC teaching with high value of education, radiance and pure – sincere - dedication and compassion for students seeking true Thai massage knowledge. We believe if a student wants to learn Thai massage in order to help other, that desire comes from a good heart and he/she should receive the highest quality of education in return. That is our philosophy—mission—goal and the total action is to give the highest quality education of Thai massage to our students. Phrakru Uppakarn Phatanakit The late abbot of Wat Nong Yanang, Uthaitani province. He passed away on Dec 15, 2013. TMC honorable monk teacher and respected venerated advisor. He was a renowned monk in traditional Thai medicine and Thai massage. His temple has been a place to help and heal people from all walks of life around Thailand for post-hospital care from stroke or paralysis and other illnesses both Thais and some foreigners. In Thai massage field: He was the top advisor during Thai Massage Revival Project in 1985-1987. He was the advisor of the Health & Development Foundation to further improves knowledge in Thai massage and traditional medicine. Phrakru Uppakarn Phatanakit was the advisor for several universities in developing curriculum major in traditional Thai medicine throughout the country. With Phrakru Uppakarn Phatanakit’s blessing, Arjan Tuan Ruangyoo, his top disciple, has taught TMC teachers on therapeutic lessons. TMC teachers continue to receive training under the venerated monk’s guidance and instruction. Phrakru Uppakarn Phatanakit was TMC venerated teacher and the chief advisor in Thai massage and Thai Traditional Medicine. TMC continues to honor him and follow his teaching. Arjan Tuan Ruangyoo Top disciple of our monk teacher. Arjan Tuan learned the ancient art in traditional Thai massage and traditional Thai medicine at the temple from Phrakru Uppakarn Phatanakit for 30 years. He and his wife live and work at the temple to offer their services to the monks and the people who come for help for over 20 years. He is responsible for training Thai therapeutic massage to therapists, treating and preparing herbal medicines for those who are in need at the temple. He was one of the twelve great teachers during the Thai Massage Revival Project in 1985-1987. 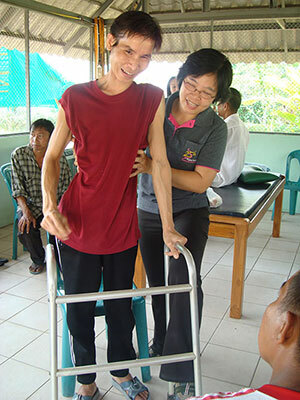 Arjan Tuan continues to be an active advisor of the Healing Center Project at the hospital until now. He is honored, among the top traditional medicine teachers as a traditional medicine practitioner licensed by the National, Traditional Thai Medicine Institute under the Ministry of Public Health. He is an appointed Thai massage teacher for the Skill Development Department in the lower northern part of Thailand, training Thai massage therapists in the areas. He has trained over a thousand of students until the present time. TMC team is proud and honored to be his life time students and will follow his teaching to further benefit mankind. Dr. Chao Duangduan na Chiang Mai The revered Lanna Princess is the president of Cultural Department of Chiang Mai among honorary leading status of other organizations. 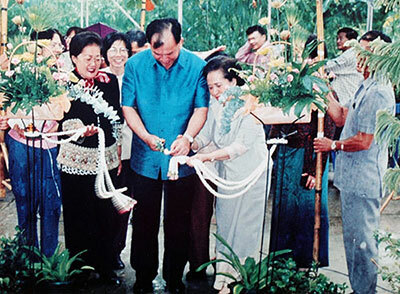 Dr. Chao Duangduan blessed TMC at the opening ceremony along with Chiang Mai deputy governor in 2001. She has been TMC’s major advisor for quality education in terms of Thai culture regarding Thai massage practice for all these years. TMC is gratefully for the honor received from Dr. Chao Duangduan in her advice and caring to our school, the teachers, staff and students. She regularly visits the school to monitor the quality and receives massage from the teachers at TMC. Dr. Chao Duangduan na Chiang Mai is TMC honorary cultural advisor. We are highly honored and most gratitude to Dr. Sudhee to grant TMC his valuable time to formulate a relevant subject based on his fascinated experience, the subject titled "Pain Mechanism in Relation to Thai Massage (Practical Knowledge about Neck and Back Pain)" is a life time opportunity for TMC students taking the course on Teacher Training GCT 600 Program. Assistant Professor Yingpan Anusri, M.S. Retired assistant professor Department of Anatomy, Faculty of Medicine, Chiang Mai University with MS Science in Anatomy degree from Chiang Mai University. Associate Professor Dr. Aatit Puangmali, Ph.D. in Physiotherapy from University of Queensland, Australia, Dr. Aatit holds the post of Associate Professor and Vice Dean at Department of Physical Therapy, Faculty of Associated Medical Sciences, Chiang Mai University. TMC is privileged and honored for an exchange education privilege with the Department of Physical Therapy, Faculty of Associated Medical Sciences, Chiang Mai University. Dr. Aatit presents his lecture to 5 week and 10 week program at TMC. “Applied Anatomy, Physiology and Kinesiology for Thai Massage” student taking the course on Professional Intensive Thai Massage 150 Hour and "Anatomy & Pathology Conditions and Treatment with Advanced Thai Massage and Physiology Technique" and "Fundamental Principle of Physical Examination for Thai Massage" to Teacher Training GCT 300 Programs students. And "Integrated Manual Therapy for Thai massage: Assessments and Treatments including Stroke Patient" to Teacher Training GCT 600 Programs students. Ajarn Araya Yankai, M.S. in Physical Therapy from University of South Australia. Ajarn Araya holds a senior lecturer position at Department of Physical Therapy, Faculty of Associated Medical Sciences, Chiang Mai University from 1995 until present and a former Head of Neurological Physical Therapy Branch/Field from 2005-2010. Arjan Araya has extensive background in physical therapy as a research assistant at University of Sydney and Physiotherapy Assistant at Multiple Sclerosis Center, Australia during 2001, 2003-2004 and with teaching and practice in physical therapy at CMU until the present time. She has interest in improving lives for the elderly. She authors and co-authors several presentations and researches in the area of biomechanics and ergonomics. TMC is honored to have Ajarn Araya to join TMC adjunct professors and to lecture alternately with Dr. Aatit Paungmali on the subject of "Applied Anatomy, Physiology and Kinesiology for Thai Massage" to our students of Professional Intensive Thai Massage -5 week and Teacher Training GCT 10 week programs. Jan Chaithavuthi, RN, B.S., MPA in nursing and a master degree in Health Management from Golden Gate University, USA. She worked as a nurse specialist in the USA for twenty years. Jan has a strong interest in promoting safe, effective and pure Thai massage for the wellness of individuals and the community. She is the prime co-founder of both TMC schools. Jan was the founder and the president of the Special People Foundation (SPF), Thailand. Jan is a prime co-author of in depth-extensive research for 4 books, the 4th edition Thai massage books "Ancient Thai Massage Healing with Prana". The book is sold internationally and is used as text book by TMC students. Jan has been invited to lecture about Thai massage and healing for disabled adults and children in the Australia, Canada, Thailand, USA and lead TMC training classes in Hong Kong, Singapore, and Taiwan with TMC teachers in Thailand, Jan had established center and trained special people to heal and help themselves under SPF program. In the field of Thai Traditional Medicine, Kanchanoo is knowledgeable in Thai plants and herbs. She is a certified Thai massage practitioner and holds a post in the National Committee for Skills and Testing Standard in Thai Massage of the Labor and Development Department. She is a co-founder of TMC and co-author of the Thai Massage books with Jan. She was a vice president of Special People Foundation, Thailand. Kanchanoo has been invited to lecture and host training in Thai massage in several countries: Australia, Egypt, Malaysia and Thailand. Arjan Narumon is TMC Education Director. Narumon Kumkronglek B.A. Education Management. Formally government official for 35 years in the most important field of education. Arjan Narumon worked as education specialist officer with Ministry of Education Department in Bangkok and then Chiang Mai for 30 years. Then was transferred to the new department named Cultural Department of Chiang Mai as the senior specialist officer for 5 years. Arjan Narumon is well respected in the education field of Chiang Mai. She carries with her the educational knowledge and experience of her entire life work! She is the main advisor for education improvement and quality control for TMC for many years. TMC owes our success in high quality and well structured education. It is our heartfelt appreciation that Arjan Narumon decided to leave the government post in 2012 to lead TMC in education endeavor in order to reach the excellence. We look ahead for more growth in education at TMC. Chonthicha Chaithavuthi "Gey" B.A. in Information Science, MBA in business administration from Chiang Mai University, with diploma in hotel and tourism industry and others in English language education. Gey started in management level with TMC from the inception for 10 years. Gey moved on to expand knowledge in the field of managing real estate associations. Gey returned to TMC with the goal to strengthen the quality services to support students' learning success. Gey is fully responsible for overseeing the school policy, students and school affair, maintain high quality of services and liaison for students and related organizations. Gey’s background and education plus her gentle personality enable her to perform her task successfully and maintain high standard for the school. Students’ first contact to TMC is via Gey. Her support to them is helpful for their journey to achieve their education goal in Thailand. Patidta Aryuyuen graduated with BS Physical Therapy from University of Phayao. She has been training at five different hospitals during her study. After graduation Thip has been practicing as physical therapist leading in treatment and healing for clients at well-known health care facilities in Bangkok and Chiang Mai. With her passion in Thai massage and her acceptance of Thai massage as an important part in healing for her clients, Thip pursued learning and training in Thai massage with the Ministry of Public health program. She is a licensed Thai massage practitioner and instructor. She received further training in Teaching Credential of GCT 600 hour Program from TMC. Patidta brings along with her the education and strong background in Physical Therapy and Thai massage to be an important part of TMC teaching team. She applies her knowledge and experience in teaching successfully. Her compassion for healing shown in the training with students. She has strong input in curriculum development and classroom planning. Thip is responsible in teaching classes and her special role is to screen students when have physical problem for safety in learning. Supatra Thamratnaporn "Pui" is a Certified Teacher at TMC. Supatra Thamratnaporn or "Pui" graduated Bachelor degree in Mass Communication from Chiang Mai Rajabhat University. She received further training in Teaching Credential of GCT 600 Hour Program from TMC and a government certified Thai Massage teacher. She is well-trained in massage skill and teaching experience, she fulfills her intention to assist students to complete competency and performance in the classroom. She has a great mind of volunteer for training Therapeutic Thai Massage for local community to disabled children and senior people. Supatra has been with teaching team of teachers in several workshops and conferences by “Lanna Health and Promotion International Conference”, Chiang Mai. The latest is to be the instructor in the Thai Massage School of Chiang Mai and Thai Massage School of Thailand International Conference 2017 for Thai massage workshops. Her role at TMC is the senior teacher with solid knowledge and experience in Thai massage and teaching. She has strong input in curriculum development and classroom planning. Sukunya Thrmmasorn "Nim" is a Certified Teacher at TMC. Sukunya Thrmmasorn "Nim" graduated vocational diploma from Chiang Mai Vocational College. Sukunya started in administration career before she discovered herself to have passion in Thai Massage. Nim has several years of experience in Thai massage practice until she joined TMC and received further education in Thai massage teacher training program 600 hour curriculum. She earned the Teaching Credential of GCT 600 Hour Program from TMC. She brings in her strong education background and field experience to apply with TMC curriculum in classroom training. Nim has been providing Thai massage course training for several communities in northern Thailand. She is the instructor at the school. Nim has been with teaching team of teachers in several workshops and conferences by “Lanna Health and Promotion International Conference”, Chiang Mai. The latest is to be the instructor in the Thai Massage School of Chiang Mai and Thai Massage School of Thailand International Conference 2017 for Thai massage workshops. Her role at TMC is the senior teacher with solid knowledge and experience in Thai massage and teaching. She has strong input in curriculum development and classroom planning. Angsumarin Jakeaw "Ao" is a Certified Teacher at TMC. Angsumarin Jakeaw or "Ao" graduated Bachelor degree in Traditional Thai Medicine from Chiang Rai Rajabhat University. This specialized branch of medicine established particularly by the government to promote health and well-being integrating traditional Thai medicine and modern health care to the people. Ao was appointed as Thai massage teacher at Chiang Rai Rajabhat University teaching students in the Thai Traditional Medicine undergraduate program for 3 years. In her teaching post, Ao had responsibilities of training in-class, lecturing, and clinical training based with community hospitals. 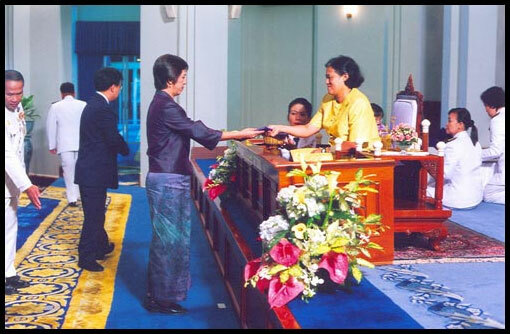 Ao also dedicated herself to serve community by providing Thai traditional medicine and therapeutic massage to patients in remote areas in Northern region. Ao joined TMC with the aim of expanding her teaching knowledge and shares her experiences. She received further training in Teaching Credential of GCT 600 hour Program from TMC. Ao is a government certified Thai massage teacher by the Ministry of Education Department. Ao has been with teaching team of teachers in several workshops and conferences by “Lanna Health and Promotion International Conference”, Chiang Mai. The latest is to be the instructor in the Thai Massage School of Chiang Mai and Thai Massage School of Thailand International Conference 2017 for Thai massage workshops. Her role at TMC is the senior teacher with solid knowledge and experience in Thai massage and teaching. She has strong input in curriculum development and classroom planning. Duangduen Chomdet "Duen" is a Certified Teacher at TMC. Duangduen Chomdet Teaching Credential of GCT 600 Hour Program. Duangduen or "Duen" has extensive training in Thai massage and teaching for over ten years. Graduated from TMC GCT 600 Hour Program and additional training in house. Duangduen has been in Thai massage field 15 years. She earned government certified Thai massage teacher and has been providing Thai massage course training for several communities in northern Thailand. Duangduen is an international instructor. She has represented TMC to teach Thai massage courses in Hong Kong and in several communities in Thailand. 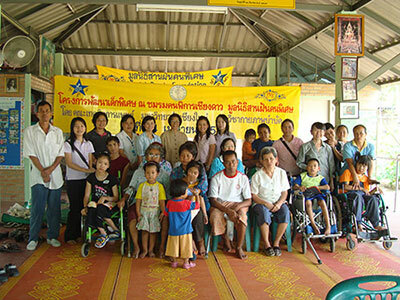 She has been training parents and staff for disabled children and adult to apply Thai massage for better health. Duen hold the post of a government certified Thai massage teacher at TMC. Her core responsibilities are in course planning and staff training. She is the instructor at the school. Duen has been with teaching team of teachers in several workshops and conferences by “Lanna Health and Promotion International Conference”, Chiang Mai. The latest is to be the instructor in the Thai Massage School of Chiang Mai and Thai Massage School of Thailand International Conference 2017 for Thai massage workshops. 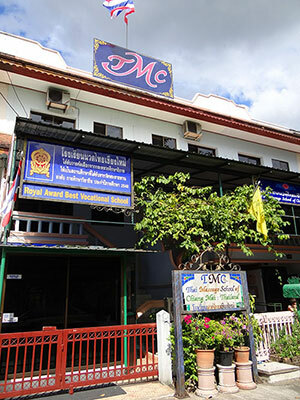 Her role at TMC is the senior teacher with solid knowledge and experience in Thai massage and teaching. She has strong input in curriculum development and classroom planning. Jansuai Phosri "Dao" is a Certified Teacher at TMC. Jansuai Phosri Teaching Credential of GCT 600 Hour Program. Jansuai or "Dao" has extensive training in Thai massage and teaching for over ten years. Graduated from TMC GCT 600 Hour Program and additional training in house. Jansuai has been in Thai massage field 20 years. She is a certified Thai massage teacher and has been providing Thai massage course training for several communities in northern Thailand. Dao is an international instructor. She has represented TMC to teach Thai massage courses in Hong Kong and in several communities in Thailand..
She has been training parents and staff for disabled children and adult to apply Thai massage for better health. Her core responsibilities are in staff training to perfection of massage. She is the instructor at the school. Dao has been with teaching team of teachers in several workshops and conferences by “Lanna Health and Promotion International Conference”, Chiang Mai. The latest is to be the instructor in the Thai Massage School of Chiang Mai and Thai Massage School of Thailand International Conference 2017 for Thai massage workshops. Her role at TMC is the senior teacher with solid knowledge and experience in Thai massage and teaching. She has strong input in curriculum development and classroom planning. Suwimon Pengta "Aam" is a Certified Teacher at TMC. Suwimon Pengta "Aam" Graduated Bachelor degree in Traditional Thai Medicine from Chiang Rai Rajabhat University. This specialized branch of medicine established particularly by the government to promote health and wellbeing integrating traditional Thai medicine and modern health care to the people. 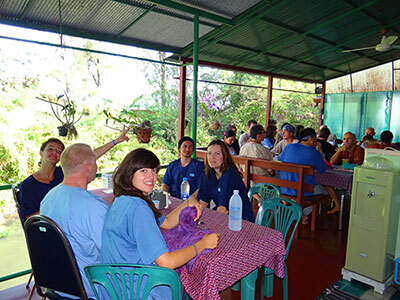 Aam gains her experience from practicing Thai medicine in the hospital in the south and returned to the north to continue her profession concentrating in therapeutic Thai massage. Aam loves teaching. She received extensive training in Thai massage teaching GCT 600 hour program. Aam is a government certified Thai massage teacher by the Ministry of Education Department. Aam has been with teaching team of teachers in several workshops and conferences by “Lanna Health and Promotion International Conference”, Chiang Mai. The latest is to be the instructor in the Thai Massage School of Chiang Mai and Thai Massage School of Thailand International Conference 2017 for Thai massage workshops. Her role at TMC is the senior teacher with solid knowledge and experience in Thai massage and teaching. She has strong input in curriculum development and classroom planning. Weerawat Dej-udom “Aon” Bachelor Degree in Business Administration with diplomas in Electronics and Electronics Computer. Aon has experiences in graphics, print media, book publishing and marketing. He has high competency in print media work and design as well as video editing. Aon is responsible in major computer work in the school. He also takes care of computer hardware, electronic appliance-building repairing and maintenance in the school. He is a very calm and effective person who is easy to work with. Wansiri Panawera “Jik” Bachelor Degree in English from Rajabhat University. Jik has experiences in a few restaurants in Chiang Mai as a cashier and an administrative officer. Jik has a very important role in administrative work at TMC. She is the one who make a plan for welcoming students on the first day, supporting the teachers according to different daily schedule until student graduation. Her friendliness and service mind brought positive vibe to the school. Worawut Chaithavuthi “Odd” He has experience in transportation service in Bangkok before. He is a high responsibility and effective person. He is responsible for coordinating with the banks, external agencies and government authorities as part of administrative work. He also takes care of TMC transportation and working with all taxi drivers to ensure that picking up service for the students are working properly. He is one of a very respected senior staff at TMC. Pradap Praibueng “Lek” She moved from Patanee Province to live with her family in Chiang Mai. She has various experiences in the past 12 years such as sale person in convenience store, cleaning, cooking and gardening. She is responsible for Housekeeping work at TMC. With her experience and personality, she is very happy working at TMC and taking care of all housekeeping work at TMC. Mali Kommul “Preow” She moved from Srisaked Provice to live with her family in Chiang Mai. After her son went to school, she started working in a high school in Chiang Mai as a cook. After that she came to work at TMC. Preow loves sewing, drawing and cleanliness. She is a very funny, friendly and productive person. She is very happy working at TMC. She is responsible for all housekeeping work at TMC. All teachers have extensive Thai massage experiences in their communities. Their real life background have provided them with diverse opportunities to learn directly from old and wise massage teachers, many of whom were their great grandparents or the elders in the villages. 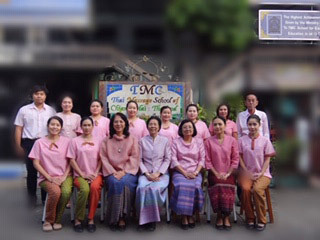 The teachers have also received formal Thai massage training from government supported schools and further completed training of formal teacher training program at TMC for more uniform Thai massage practice, following TMC curriculum. Teachers at TMC perform the same teaching techniques to all students for better learning result and to avoid confusion. However, during their massage services to students, the techniques may be varied. Many teachers are continuing learning at various places. At TMC, the teaching team will undergo on-going training to strengthen and/or improve their knowledge at all time. TMC is a place where many organizations, both private and government sectors, come to learn special courses in Thai massage throughout the years. TMC teachers have been invited to teach TMC curriculum to different parts of Thailand and around the world on request from public. Some government supported schools have requested the use of TMC workbook for their courses. With TMC intensive curriculum and the teaching team of solid knowledge, students are able to learn the ancient art of Thai massage from the teachers at TMC effectively with compassion and peace. A (big) note on our supporting staff, housekeepers, drivers etc. they offer their services to the students from their hearts. Students can feel from practice clothes and sense from all the surrounding while being at TMC, and feel safe while students are on the road with them. We welcome all sincere learners to join us at TMC. You will be a part of the world of beautiful souls. We are all here for the same reason to learn Thai massage and to be kind to one – another. You might meet friends from past life or find a new one in this life, or just passing through with the joy of Thai massage. Both TMC schools are accredited and approved by the Thai Ministry of education with school permits to offer approved curriculum to the general public according to the department guideline and requirements. TMC curriculum meets requirement from Thai Ministry of Public Health regarding professional therapists. Thai students who attend TMC courses and complete required hours may perform Thai massage as massage therapists. TMC curriculum meets the requirement of the Ministry of Labor Department. Students complete required hour courses may undertake the Skill Test for certificate to apply to work as Thai massage therapists aboard. TMC has educational exchange rapport with Chiang Mai University department of Physical Therapy in exchange of Thai massage education. The department, under the mentorship of Assistant Professor Pienchai Khamwong, Ph.D., P.T. 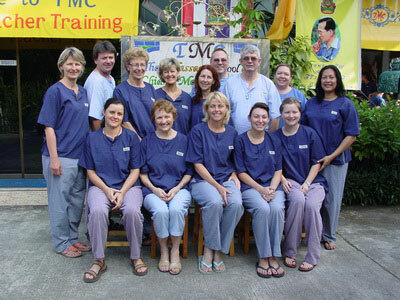 often bring exchange physical therapy students from Australia to take part in Thai massage training at TMC. TMC has received education assistant and training from the Department of Physical Therapy to lecture TMC students of professional level and teacher training programs by Dr.Attit and Arjan Araya. The Physical Therapy Department provided physical therapy for disabled children and adults under the support of TMC and Special People Foundation. 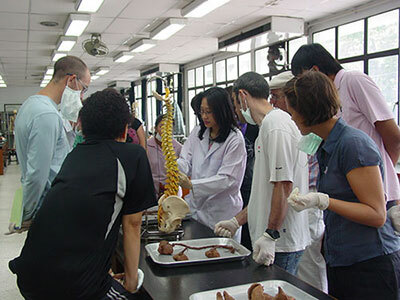 TMC teacher training students (GCT) attend Anatomy Cadaver Lab class at Chiang Mai University Faculty of Medicine. 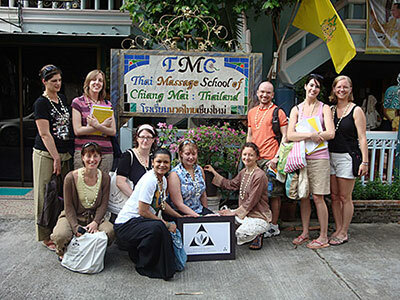 To support our international students for their education in Thai massage and continuing education for the professional in the field to renew their licensing, TMC has pioneered the continuing education by started application for this process for the Thai massage schools in Thailand. Thus, making it possible today for many massage schools to offer continuing education hours to international students from around the world in Thailand. of the USA and received approval for CE Provider # 403533-00 since 2004 and continue until the present time with approval of 24 courses for the NCBTMB members to explore their learning Thai massage field. May take CE courses at TMC Under the same guideline as NCBTMB approved provider. Therapist Members May take CE courses at TMC Under the same guideline as NCBTMB approved provider. the California State Board of Registered Nursing, Provider # CEP 15177, for 30 Contact Hours"
TMC is the only Thai massage school authorized by the California State Board of Registered Nursing as approved provider #CEP 15177 to offer courses in Thai Massage to California registered nurses in Thailand. This is the encouraging steps for Thai massage to be a part of healing for California nurses to apply with their patients who can benefit from this healing art. This deed is most honored by Jan – the co -founder of TMC from spending over 20 years as a registered nurse in California and finally able to bring the art of Thai massage that she believes in the healing benefits to the hands of California nurses. When MMA members inquired TMC if we could apply for CEP provider status so the students can earn continuing education credit for their association, we contact the association for this regard. What we received was the notion that after reviewing TMC application and curriculum details, the management team of MMA would like to visit the school to evaluate prior to making the decision. 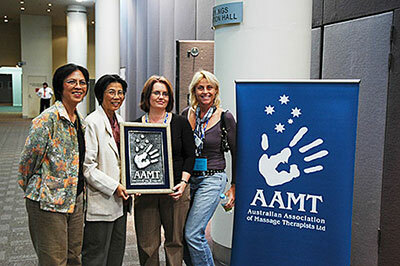 In 2005, TMC was the first school Australia Association of Massage Therapists ever awarded CEP status outside Australia and continue to be in good standing. MMA and TMC also engaged in the exchange of education by setting study group tour for MMA members along with board of director members to TMC school for Thai massage education.MMA had invited TMC directors to join MMA conference and workshop in Australia with successful result of full - house attendance for the workshop in Thai Seated Massage. Both institutions continue strong friendship in building the same goal of high standard education for their members and other learners. Recently, Tricia Hughes CEO of MMA appeared at TMC International Conference in Chiang Mai, Thailand as the keynote speaker on 4th Feb 2017 on the How to Build a Credible and Successful Business with enthusiastic welcome from the participants. Follow with a warm visit to TMC school. 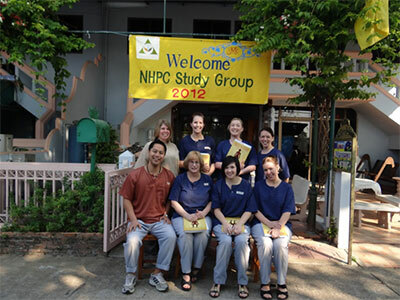 Thai Massage School of Chiang Mai isapproved by the National Health Practitioners of Canada (NHPC) for Continued Competency Program. For course list click here. 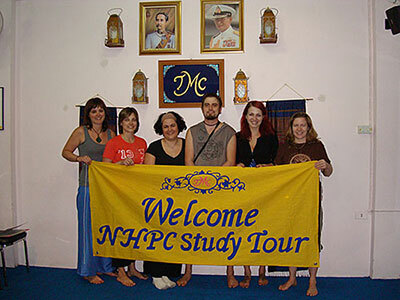 NHPC acknowledge TMC as the Thai massage school for their members since 2004 and with several exchange group study tours for NHPC members to TMC. TMC director was invited to present lecture during NHPC conference in Canmore to present lecture of Thai massage to the NHPC conference in 2008. TMC was honored by the official visit of NHPC General Manager. Both TMC and NHPC continue to join efforts to improve the quality of Thai massage for the benefit of the public. Today, expanding world of massage field being an important healthcare as alternative healing, interested learners are seeking globally in the field of massage knowledge. For people wishing to have quality and genuine education in Thai massage, the task of selecting massage school and college in a faraway places—like Thailand is a major task. The prudent way is to investigate education places for their standard, integrity, honesty, quality and above all sincerely and trustworthy. Credentials stand for education. The school or college must earn approved license from government agency to function and operate as such. This is one part that students need to look for. However, like everything else in the world, sometimes, only stamp of approval may not be sufficient. What would be the right way to seek the right one then? What matters more than credentials is honesty. The education providers must be able to perform what they promise to give and stand for the principle of truth and quality education. Hence, choosing a place for education by looking for having both credentials and honesty is the first step to succeed in one’s learning adventure. The following organizations, institutes, hospitals, health centers, business places, schools, colleges, temples and centers around the world who recognize TMC schools as the education place that meet their required or expected standard. Ministry of Education appointed Thai Massage School of Chiang Mai to be the vocational training for Thai massage to community group study during 2015 training under special funding. Ministry of Public Health: Recognized and approved TMC’s curriculum to qualify Thai students who complete the training to practice Thai massage for health in the massage work place without having to take work permit examination from the department. Ministry of Labour: Appointed Kanchanoo Muangsiri, TMC school director, to sit on the “National Committee Board of Office of Skill Standards and Testing Development for Thai Massage Practitioners”. Thai massage practitioners must obtain permit to work aboard from the labor department by passing the national testing to ensure high quality. Young Women Development Center, Mae Rim, Chiang Mai in cooperation with Thai Massage School of Chiang Mai and GCT teacher training program to integration of Thai massage training for professional for young women at the center as part of the educational year. Physical Therapy Department, Chiang Mai University in cooperation on development treatment for special children. Chiang Mai Health Services Promotional Association. The Foundation for the Welfare of the Mental Retarded of Thailand, Sarapee, Chiang Mai provide on going support to the children. Interns from TMC offer massage services to the special children at this center during their training. Thai Embassy and Consulate around the world Recognized as accredited vocational Thai Massage school, qualified student to apply for Education Visa and spouse for non immigrant visa. National Certification Board for Therapeutic Massage and Bodywork (NCBTMB), USA. American Massage Therapist Association (AMTA), USA Members of AMTA may take CE courses at TMC under same guideline as NCBTMB. California Board of Registered Nursing, U.S.A.
Natural Health Practitioner of Canada (NHPC) accredited for credential programs to become members of NHPC. Massage & Myotherapy Australia (MMR), Australia Approved provider of professional massage education points PME for members. The Institute of Natural Therapies (INT), USA: State of Michigan Education Department approved courses of Level I, II and III at TMC. Florida Board of Massage Therapists USA Members may take CE courses at TMC under same guideline as NCBTMB. Georgia Board of Massage Therapists USA Members may take CE courses at TMC under same guideline as NCBTMB. 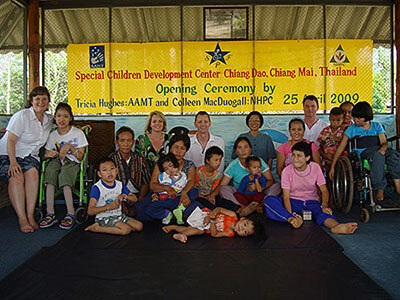 Faridcot Centers for Special Children, Punjab, India affiliated with Thai Massage School of Chiang Mai under exchanged training for Thai Massage for special children. International Spinal Institute, Kowloon, Hong Kong. Pro Therapist Academy, Singapore: Singapore Education Department approved courses of Level I,II, III, Table Thai Massage and Herbal Ball from TMC for training at PTA. Trade and Travel Representative of Thailand in Ukraine. Brookfield Massage Therapy, USA . Grandview Massage Therapy Clinic, Vancouver, British Columbia. Venus Massage Centre, N.Y., USA. Jejari Spa and Learning Centre, Malaysia. Bann Sabai Massage Shop, Cagayan de Oro, Philippines. Bann Sabai Massage Shop, Manila, Philippines. Palm Beach Reflexology Center, Manila, Philippines. Holistic Academy of Massage Therapy, Ipoh, Malaysia. Baba Farid Center for Special Children: Punjab, India.